Found: Atlantic, Indian and Pacific Oceans. Most found near Japan. Believed to feed on fishes, squid and possibly crab. 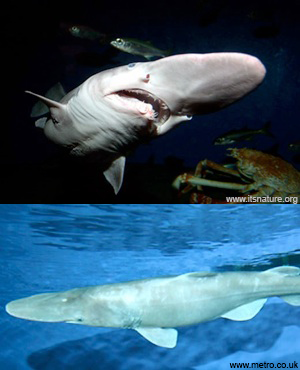 Needle-like and smooth, similar to those of the Grey Nurse Shark. Believed to be Ovoviviparous - eggs hatch inside the mother and live young are born. Only around 45 specimens have ever been found. They normally live at depths between 30-1200m. Their most interesting feature, is their elongated and flattened snout and highly protrusible jaws.